John took a lot interest in the moons of the gas giants. Which inspired one of his best stories: Ecumenical Twilight. Lastly, let me rue the passing of Mark Steyn's syndication in Britain, for his column has now been dropped by both the Sunday Telegraph and the Spectator. I don't know the inside story, so I can't be certain that the jettisoning of this notoriously conservative Canadian constitutes political self-censorship. Normally, columns are canceled for the same reason other products are discontinued: because people don't want them anymore. Maybe Steyn has just out lived his welcome. However, if it is really true that his British newspapers dropped him under pressure from radical Islamists, then the press everywhere has suffered a major defeat. Was it Steven Spielberg who said recently that the age of the movie blockbuster is over? I don't know; I can't find the quote I am almost sure I heard. In any case, if by a big picture you mean a special-effects extravaganza, there is good evidence for this proposition on Google Video. I just found a feature-length parody called Star Wreck. The film is in Finnish, with English subtitles. The acting is on the "horsing around" level. The special effects, however, are not greatly inferior to the ones that made Steven Spielberg what he is today. If effects like these are available on a rec-room budget, then what is left for the theaters but films about couples shouting at each other in their kitchens? "We realize that this is a radical conclusion - that we may have evidence for liquid water within a body so small and so cold," said Carolyn Porco, Cassini imaging team leader at the Space Science Institute, Boulder, Colo. "However, if we are right, we have significantly broadened the diversity of solar system environments where we might possibly have conditions suitable for living organisms." Suppose the speculation is true that there are caverns within Enceladus that support lakes or small seas, and that microorganisms live in those waters. 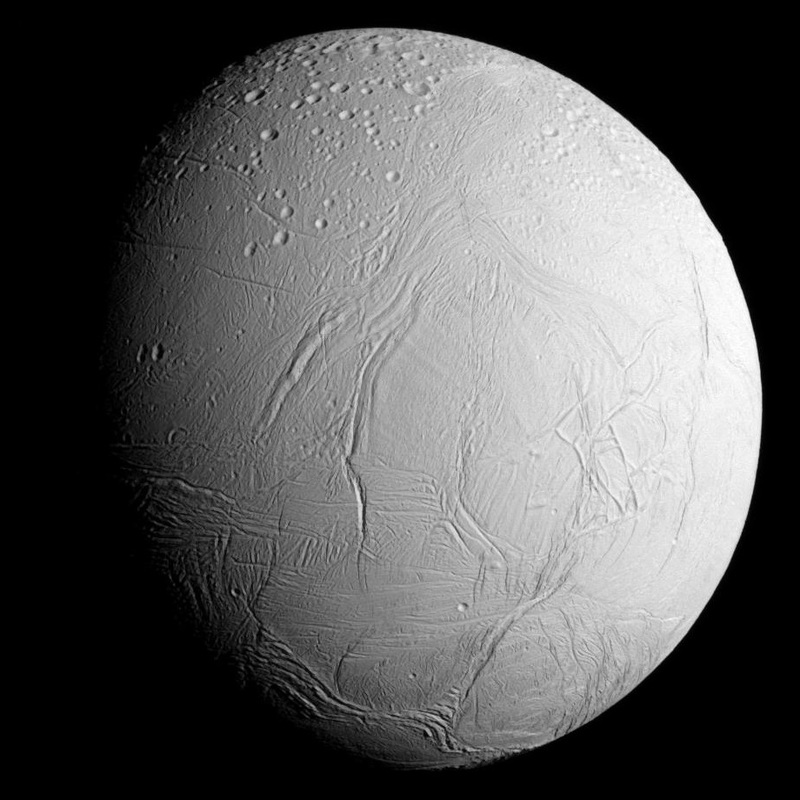 Suppose further that Enceladus has been spewing this biologically tinctured water for some significant fraction of its history. Enceladus, apparently, is responsible for a detectable ring of oxygen atoms around Saturn. Shouldn't there also be a ring of biological material? And shouldn't such a ring polarize light in a characteristic way? In other words, if there is life in Enceladus, we should be able to tell from here; or am I missing something? The mild winter let officials probe Round Valley Reservoir for six men missing for years. By Wayne Parry--Associated Press CLINTON, N.J. - Authorities call it "New Jersey's Bermuda Triangle," a watery place where people disappear. The description held true yesterday after a 41/2-hour search of the Round Valley Reservoir in Hunterdon County failed to turn up any trace of six missing boaters and fishermen, some last seen in 1973. There had to be a Bermuda Triangle in New Jersey somewhere. I am informed that the stories about the BottomLess Pit of Essex County are exaggerated, however. I can only repeat that Rove v. Wade has become like one widely reported version of Oscar Wilde's last words: "Either this wallpaper goes or I do." If the case is not overturned, then the principle of constitutional review is going to break down, possibly in some area we cannot foresee now. In any case, what Scalia seemed to actually be doing here was to avoid prejudging the next case on the issue. If he had said what I said in the preceding paragraph, he would have had to recuse himself.